There are many good reasons to come to Philadelphia for Bonhams auction at the Simeone Foundation Museum the Monday before Hershey. First is the really intriguing consignment of cars that Bonhams assembles here every year. 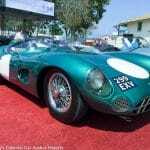 Many of them are in the spirit of Dr. Fred Simeone’s collection which comprises many rare, unrestored competition sports cars. The wonderful old Regal Underslung is a perfect example, as is the Stevens Duryea from the Roderick Rice collection. Second is the chance to absorb the positive vibrations from Dr. Simeone’s collection of legendary sports and racing cars including classic pre-war Mille Miglia and Le Mans winners, one of the legendary Corvette Grand Sports and the newest addition, the ex-Gibson family Renault AI Vanderbilt racer. And third, on the way to Hershey why not spend a night in Philadelphia and arrive early at the AACA Meet, or spend a day at the Gettysburg battlefield. This isn’t a big sale, but the choice offered is sometimes, well, choice. There are a few expensive cars, but most are sound examples looking for a good home to prolong their lives, or give them new life. It’s a lot like going to the animal shelter: some of these puppies are hard to resist. 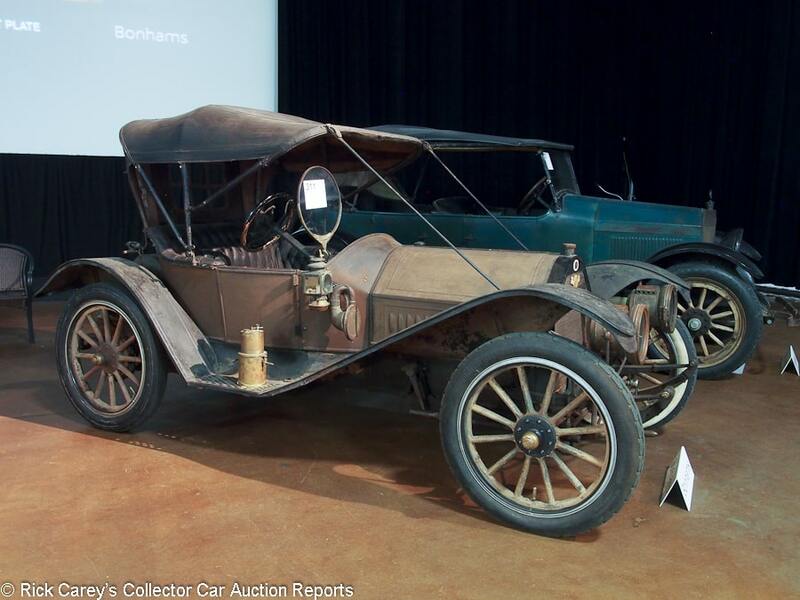 Displayed on the way into the Museum was the Lindley Bothwell dual overhead camshaft 1914 Peugeot L45 in all its pristine, unrestored, splendor that Bonhams will be selling at the Bothwell Ranch in Woodland Hills, California on November 11. 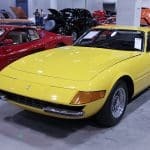 It is a treasure worthy of being part of the Simeone Foundation collection even if it isn’t a ‘sports car’. 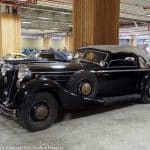 * One lot, Bentley 4 ½ liter Tourer, was a no-sale on the block at a hammer bid of $540,000 and is reported sold by Bonhams post-block but at an undisclosed amount. It is not included in this total. The reported lots that follow are sorted by Marque, Model, Body Style and Year. 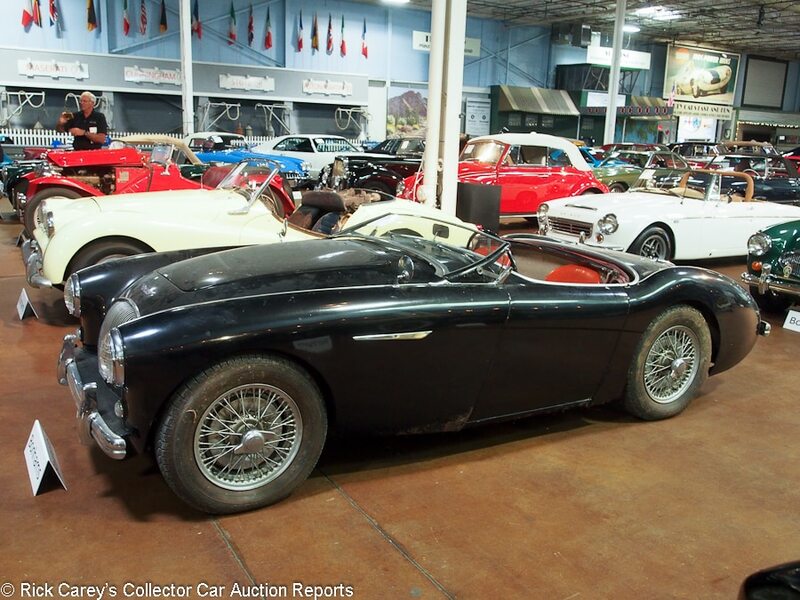 Lot # 312 1954 Austin-Healey 100/4 BN1 Roadster; S/N BN1L158587; Engine # 1B214333M; Black/Red leather; Red leatherette top; Estimate $30,000 – $40,000; Unrestored original, 4+ condition; No Reserve; Hammered Sold at $36,000 plus commission of 10.00%; Final Price $39,600 – Overdrive 3-speed, silver painted wire wheels, blackwall radial tires, aluminum valve cover. – One owner from new, showing 64,507 believable miles. A dirty original barn find. Rotten front fenders, sound but stretched original upholstery. Dirty original top. Road grimy engine and chassis. – ‘Potential’ is writ large in the result for this Healey 100 which inspires visions of the real Austin-Healey sports car rather than the later 6-cylinder touring cars. This is a 3+ result for a 4+ Healey, but that discounts the new owner’s vision of what it will be after spending many dollars and countless hours on it. 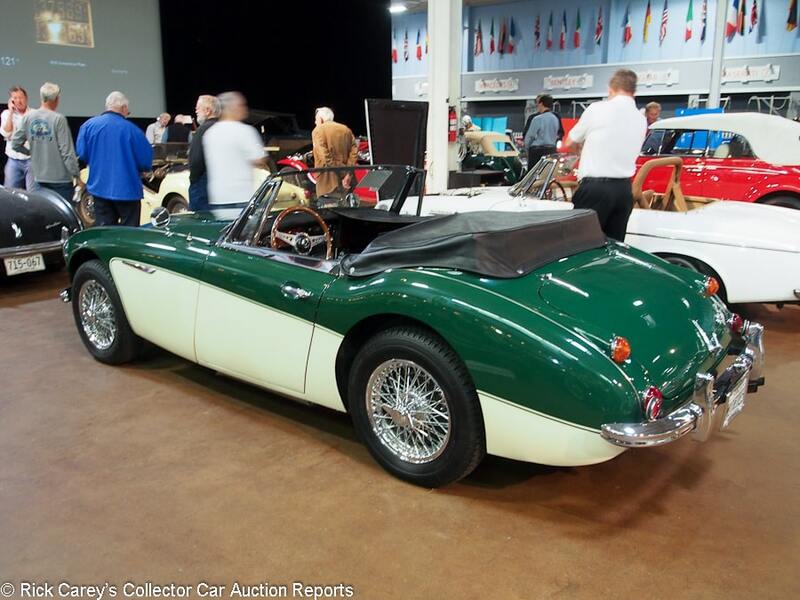 Lot # 358 1967 Austin-Healey 3000 Mk III Phase 2 Convertible; S/N HBJ8L41951; Engine # 29KRUH16474; BR Green, OE White sides/Black vinyl; Black vinyl top; Estimate $60,000 – $70,000; Older restoration, 2- condition; With Reserve; Not sold at Hammer bid of $50,000 – Overdrive, chrome wire wheels, Michelin XZX blackwalls, Moto-Lita woodrim steering wheel, underdash CD-satellite stereo, badge bar. – Good paint, chrome, interior. Lightly wiper scratched windshield. Orderly restored underbody shows some miles and paint loss. Restored in 2006, carefully maintained and lightly driven since. – It’s not surprising that the seller felt this Healey was worth more than the reported high bid. Lot # 339 1924 Bentley 3-Liter Speed Model 4-Seater Tourer, Body by Morgan & Co.; S/N 897(780); Engine # 893; Matte Black, Black fenders/Red leather; Black cloth top; Estimate $250,000 – $350,000; Older restoration, 3- condition; With Reserve; Post-block sale at $181,818 plus commission of 10.00%; Final Price $200,000 – RHD. Vee fixed windshield, single rear mounted spare, Red wire wheels, ventilator-style cowl vents. 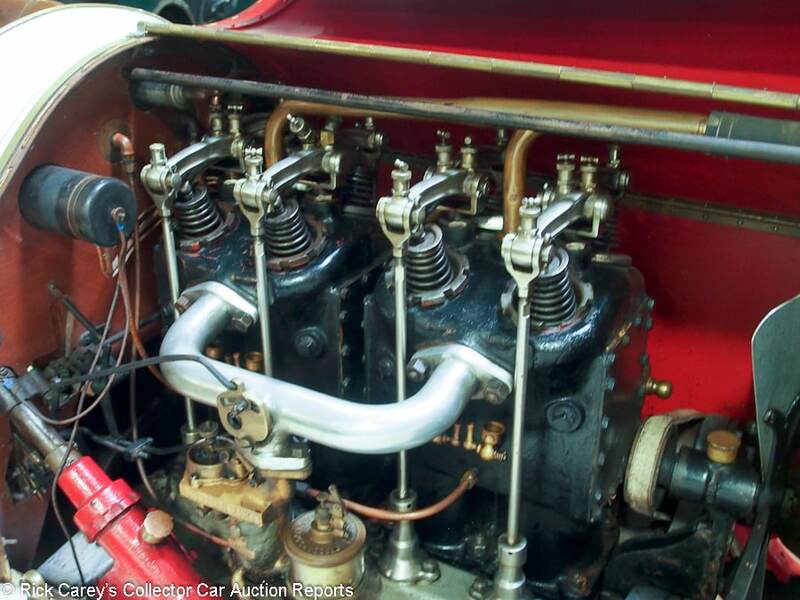 – Described in a Saleroom Notice as the original engine, the original 2-seat body has been modified to the present 4-seat tourer and the original frame (687) replaced by the present #780 from another 3-Liter Speed Model once owned by Cmdr. Glenn Kidston. Originally delivered to the Prince of Liechtenstein. New starter solenoid. Oily, used, aged but at the same time honest, usable and charismatic. It needs nothing except a thorough checkout to be driven as it should be. – It’s not unusual to find a vintage Bentley with some mixed up components and this example’s mixup is somewhat less than might be expected. It has a long history in this configuration and is more than deserving of the post-block result it earned and is a lot of car for the money. 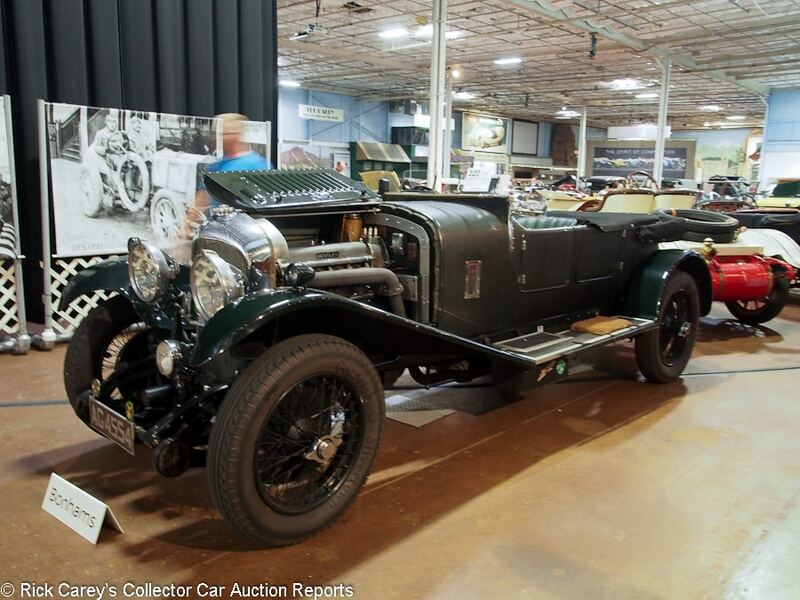 Lot # 320 1929 Bentley 4 1/2 Liter ‘Le Mans Replica’ Fabric Tourer, Body after Vanden Plas; S/N PL3496; Engine # FB3307; BR Green/Green leather; Black cloth top; Estimate $600,000 – $700,000; Rebodied or re-created, 3+ condition; With Reserve; Not sold at Hammer bid of $540,000 – RHD. Folding windshield, dual aeroscreens, single rear spare, Marchal headlights and dip beam light, dual diver’s helmet taillights. – Originally saloon bodied by Harrison, rebodied in the 70’s with the current engine and D-series gearbox. Oily engine, some thin chrome trim. Sound paint, fabric body covering and upholstery. A reproduction body driver from the David Van Schaick collection. – Bid to this result on-site and later reported sold in a post-block transaction for an undisclosed amount, there is nothing not to like about this 1970’s rebodied Bentley 4 1/2. 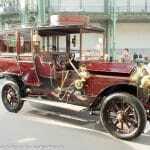 It would be boring (if unusual to survive) with its original Harrison coachwork and makes a statement with years of use on Bentley and tour events by David Van Schaick. A great, thumping 4-cylinder Bentley. 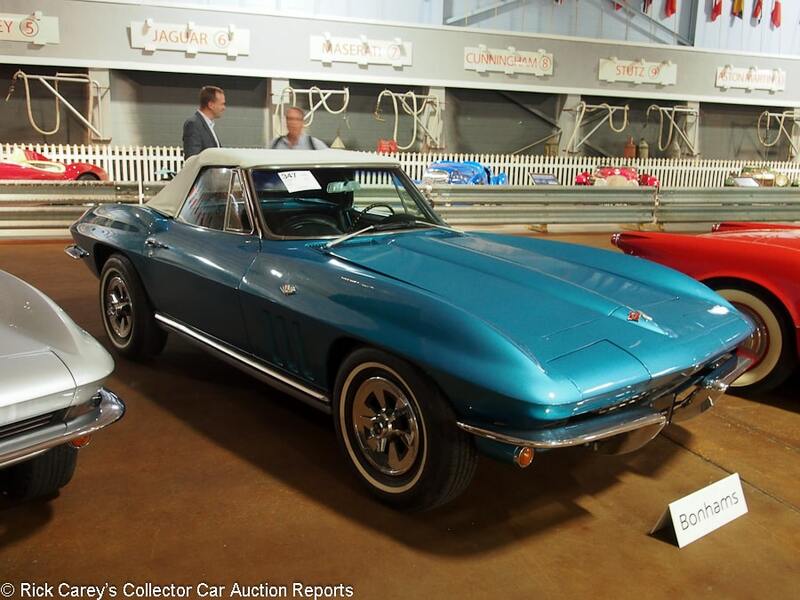 Lot # 334 1960 Chevrolet Corvette Convertible; S/N 00867S101705; Engine # T0810GF; Blue, White coves/Black vinyl; White vinyl top; Estimate $55,000 – $75,000; Older restoration, 3 condition; With Reserve; Hammered Sold at $51,000 plus commission of 10.00%; Final Price $56,100 – 283/270hp dual quads, 4-speed, power top, radio and heater delete, spinner wheel covers, whitewalls, 4.11 Positraction. – Sound but flawed clearcoat paint with overspray in the wheelwells and inside the doors. Paint was not finished inside the door jambs. Sound upholstery and loose fitting top. Orderly engine compartment. Dusty old chassis. Replacement engine block with a GF suffix suggesting it was originally a 283 2-barrel. – Not particularly appealing cosmetically but intriguing for what it doesn’t have (heater, radio and original engine block) and what it does have (dual quads, Posi and the rare power top.) The bidder took it all in and arrived at a realistic result. 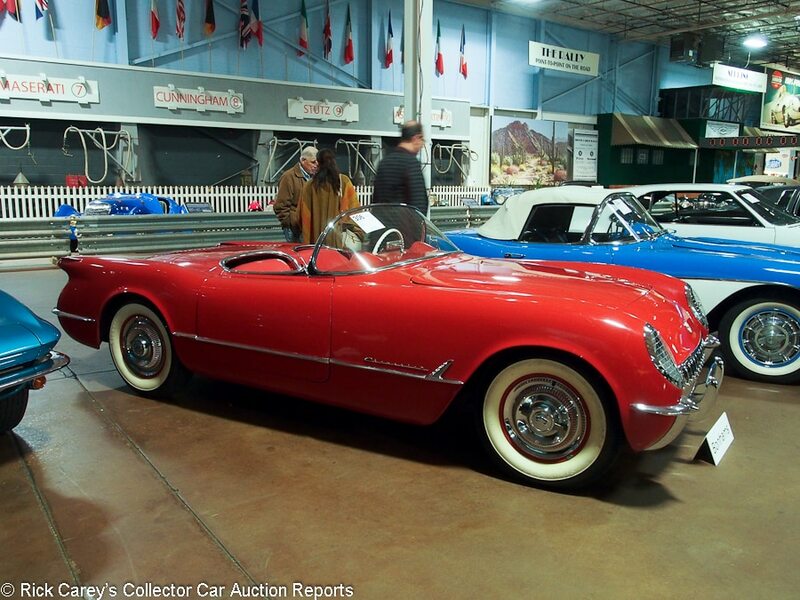 Lot # 306 1954 Chevrolet Corvette Roadster; S/N E54S002706; Engine # 05I58I6F54YG; Sportsman Red/Red vinyl; No top; Estimate $50,000 – $65,000; Incomplete restoration, 4+ condition; With Reserve; Hammered Sold at $52,500 plus commission of 10.00%; Final Price $57,750 – Spinner wheel covers, whitewalls. – Flawed old repaint. Wiper, washer nozzle and soft top clip holes are filled and crudely touched up. Interior door panels, top, radio and more are missing. The chassis frame is done but has been sitting a long time and is dusty. The windshield is cracked. No side curtains or interior trunk panels. Very much a project. – Buying a partially restored car is fraught with issues, especially one like this that was begun in 1990 and has languished since then. 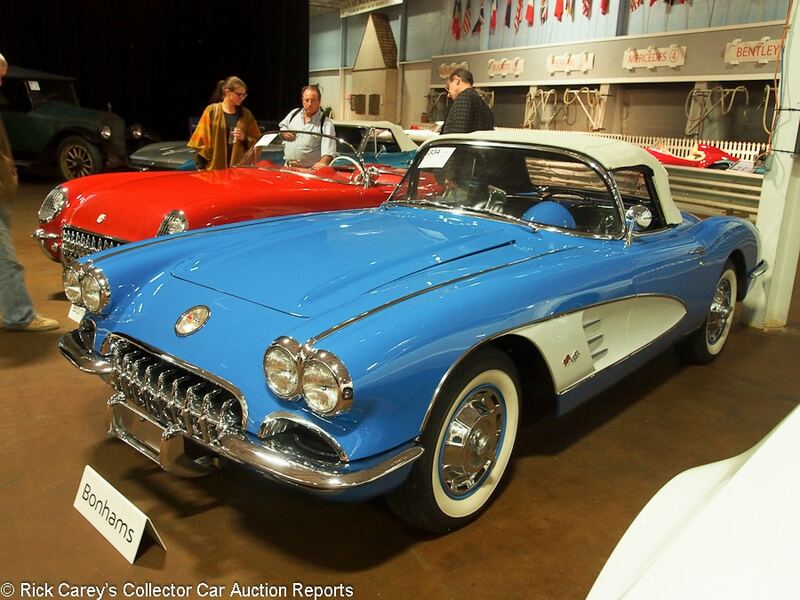 The bidders saw more in this Corvette than is apparent on the surface and paid a generous price for it. Good luck. 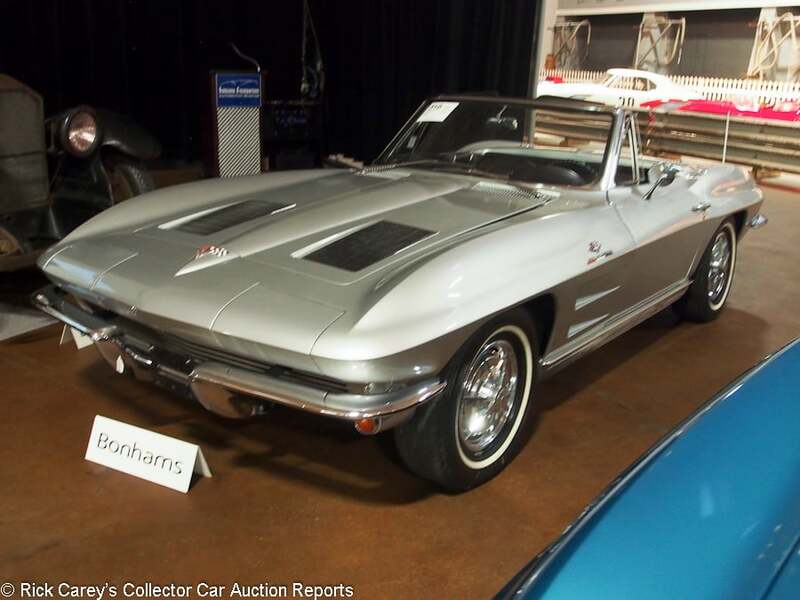 Lot # 318 1963 Chevrolet Corvette FI Roadster; S/N 30867S119892; Engine # 3119892F0709RF; Sebring Silver/Black vinyl; White vinyl top; Estimate $75,000 – $100,000; Cosmetic restoration, 3 condition; With Reserve; Hammered Sold at $75,000 plus commission of 10.00%; Final Price $82,500 – 327/360hp Fuel Injection, 4-speed, 4.11 Positraction, AM-FM, spinner wheel covers, narrow whitewalls. – Sound clearcoat repaint poorly prepped around the hood openings. The door window pockets are dirty and full of body shop dust and detritus. Orderly engine compartment and underbody. Sound upholstery, scratched console cover. Thin windwing frame chrome. NCRS documented original engine. A cosmetically restored driver Corvette. – This is a generous price for a mediocre Corvette, even with this desirable drivetrain. 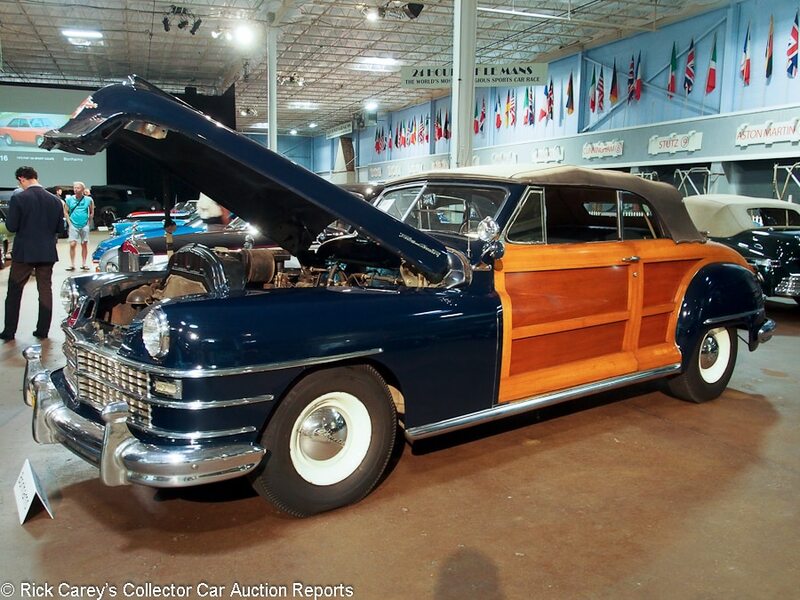 Lot # 355 1948 Chrysler Town & Country Convertible; S/N 7407270; Engine # C3967290; Newport Blue, Semigloss varnish/Green leather, Beige cloth; Heather cloth top; Estimate $100,000 – $130,000; Visually maintained, largely original, 3- condition; With Reserve; Not sold at Hammer bid of $90,000 – Fluid Drive, pushbutton radio, vacuum gauge, heater, remote spotlight, Cream wheels with hubcaps, blackwall bias ply tires. – Owned by one family from new after winning it in a contest. Weak chrome, sound upholstery, cracked old top. Dirty chassis and engine compartment are original and unrestored. The wood all matches, has no water stains and appears to be original but wasn’t thoroughly sanded before the most recent varnish and has cracking visible under the topcoat. Barely usable as is, really it’s a sound and complete restoration project. – The story of this Town & Country is one of its best attributes, not only the single ownership but also how it was acquired. As good as the story is, however, it is aged and deteriorated and it could have been sold with minimal regret at the reported high bid. 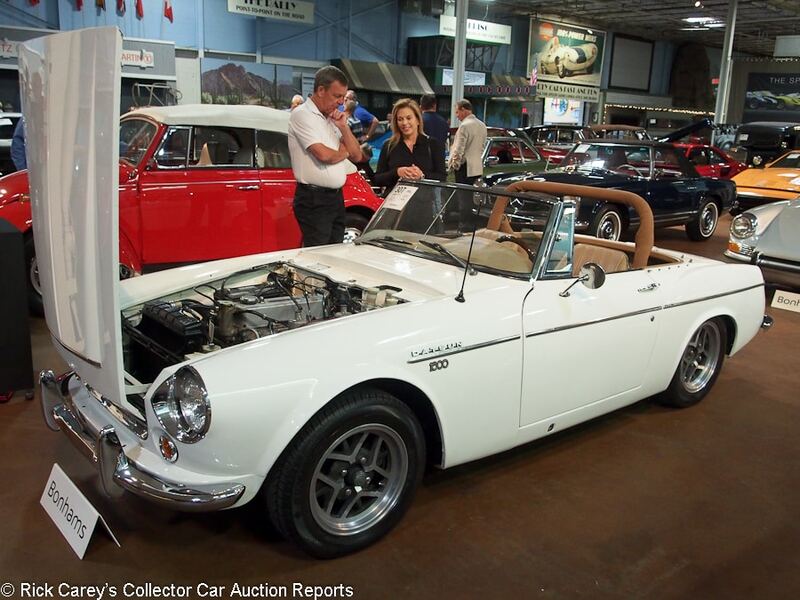 Lot # 307 1967 Datsun Fairlady 1600 Convertible; S/N SPL31115056; Engine # R58910; Ivory/Tan vinyl; Estimate $10,000 – $15,000; Incomplete restoration, 3- condition; No Reserve; Hammered Sold at $6,000 plus commission of 10.00%; Final Price $6,600 – Nardi fat woodrim steering wheel, aftermarket alloy wheels, padded rollbar. – No hubcaps on the wheels, windshield washer nozzles missing. Quick old repaint with some overspray and masking holidays. Good chrome and upholstery. Clean and orderly unrestored engine compartment. Only partially done and not encouraging. 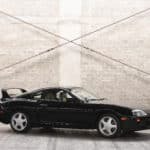 – Described as an ‘interim’ Fairlady with 1600 engine and narrow body, this is a test of how accepting collectors are of early Japanese sports cars. It brought nothing here but has some potential either as a track day car (in which configuration it appears here) or as a completed restoration. 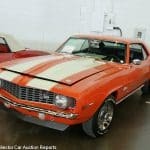 Is it worth $50K done and pristine? This may be the test case. 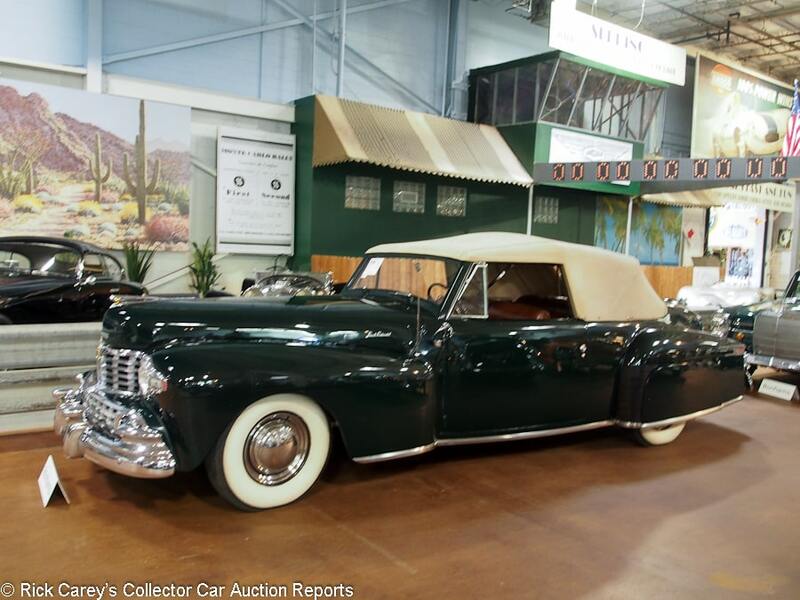 Lot # 346 1948 Lincoln Continental Convertible; S/N 8H182050; Engine # 58HA01622; Dark Green/Tobacco Brown leather; Beige cloth top; Estimate $25,000 – $35,000; Older restoration, 3- condition; With Reserve; Hammered Sold at $20,500 plus commission of 10.00%; Final Price $22,550 – Overdrive 3-speed, skirts, wide whitewalls, hubcaps and trim rings, dual outside mirrors, bumper tips, pushbutton radio. – Sound old paint with small edge chips and small stress cracks. Failing repair on top of the left front fender. Good major chrome but flaking taillight bezels and lower grille elements. Good gauge faces with pitted chrome bezels and horn ring. Worn steering wheel rim. 1965 AACA and unnumbered CCCA National First Prize. Fresh out of long term neglect, runs and drives but still needs work. – This result represents a severe discount for the restoration’s age. The Continental needs attention in most areas but is better than the price indicates, and a good value for the new owner especially if he or she has time to spend on it. Lot # 319 1917 Mack AB C-Cab Stake Bed; S/N 579334; Red, Yellow chassis/Black; Estimate $15,000 – $25,000; Truck restoration, 3- condition; No Reserve; Hammered Sold at $8,000 plus commission of 10.00%; Final Price $8,800 – Acetylene headlights, kerosene sidelights, steel disc wheels, varnished bed rails, wood framed windshield. – Orderly and fairly dry engine compartment looks little used. Sound old paint with edge chips and age. Done well but now aged even if lightly used. – Offered here a year ago in essentially the same condition, it was reportedly bid to $15,000. More realistically estimated today, the result here indicates the challenge of owning a big old Bulldog, hauling it home and doing more than looking at it. On the other hand, showing up at the lumber yard to pick up some 2x4s and sheathing will be an event worth considering. It is a neat Bulldog. Lot # 366 1937 Mercedes-Benz 230N Roadster; S/N 155082; Engine # 155082; Brown, Cream sides/Tan leather; Beige cloth top; Estimate $100,000 – $125,000; Incomplete restoration, 3- condition; No Reserve; Hammered Sold at $136,000 plus commission of 10.00%; Final Price $149,600 – Bosch headlights, dip beam lamp, disc wheels, hubcaps, dual sidemounts, rumble seat, folding windshield. – Good paint and interior. Chrome is dull and thin. Dip beam lens is missing. Frame, chassis and engine have been done to touring standards and are aged. Front seat cushion is missing, as is one of the hood panels and the side curtains. Top frame is restored, the top is older but serviceable. Body is lightly filled, generally under 2mm along the bottom. Right lower cowl and frame cover under the right door are filled over 2mm. Both front fender skirt area has been replaced or extended very neatly. Inside the body is neatly done. Gauge faces are done and crisp but the speedo lens is lightly fogged or dirty. Aside from the seat cushion, windowsill trim, side curtains and hood panel it is in drivable condition once it’s running. – One of two M-B 230n in today’s sale, the other was a derelict 4-Door ‘Limousin’ useful for parts from the same estate collection. 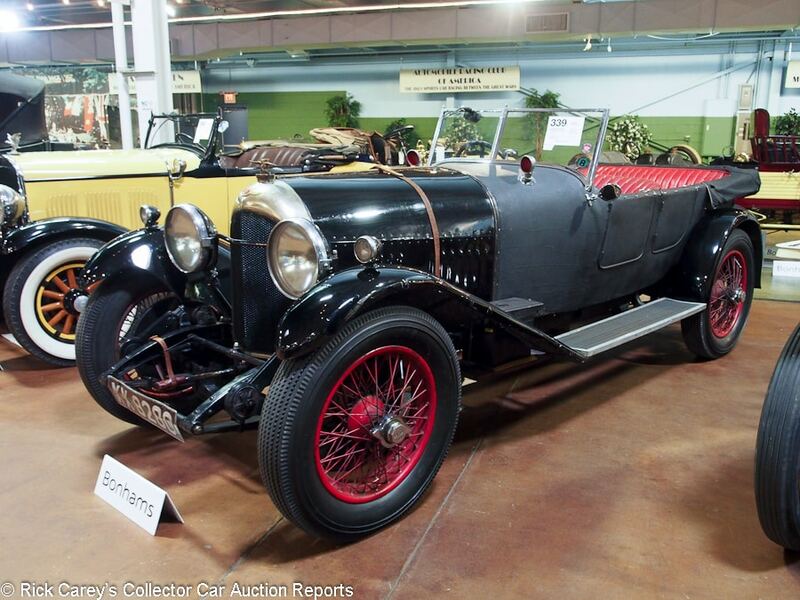 This Roadster attracted much attention and bidding on the telephone, as can be seen from its final over-estimate price. It appears to have most of its parts but whoever finishes up the restoration will have some vexing issues, like matching the leather on the front seat backs. The parts car won’t be of any help: it went to a different buyer. 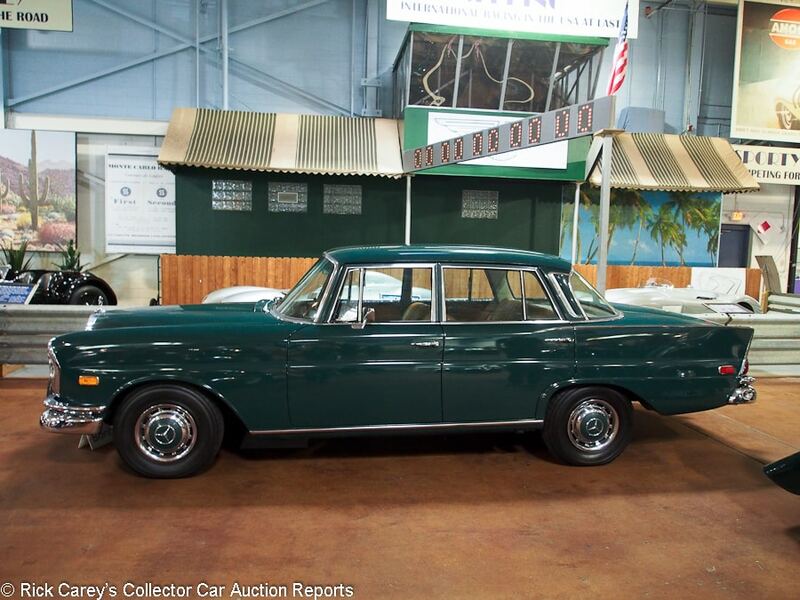 Lot # 338 1968 Mercedes-Benz 230S 4-Dr. Sedan; S/N 111012110675; Dark Green/Tan vinyl; Estimate $15,000 – $25,000; Unrestored original, 3+ condition; No Reserve; Hammered Sold at $15,000 plus commission of 10.00%; Final Price $16,500 – Automatic, heater, no radio. – Two owners from new. Dull original paint with some areas of microblistering. Very good original interior, dash, gauges and steering wheel. Original undercoat in the wheel wells. Wiper scratched windshield. Good major chrome, thin side window frame chrome. Dusty, orderly original engine compartment. – This fintail Mercedes attracted plenty of deserved attention during the preview. Its preservation and originality are remarkable, especially considering its mundane family car nature which makes its survival exceptional. Never neglected, it brought a superior price that is fully justified by its condition and rarity. 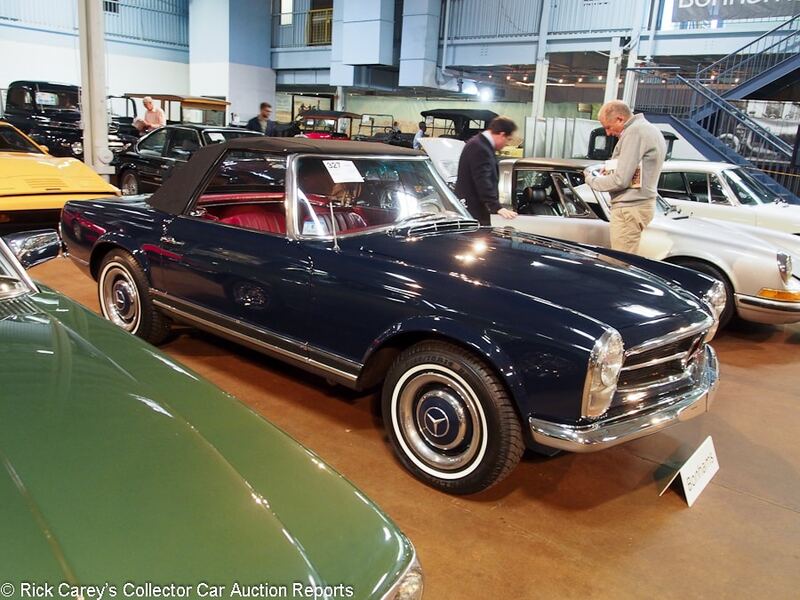 Lot # 327 1966 Mercedes-Benz 230SL Roadster; S/N 11304210013321; Engine # 12798110011026; Dark Blue/Red leather; Black cloth top; Estimate $40,000 – $60,000; Visually maintained, largely original, 3 condition; With Reserve; Hammered Sold at $38,000 plus commission of 10.00%; Final Price $41,800 – 4-speed, hubcaps, trim rings, narrow whitewalls, Becker Europa TR AM-FM, rear seat – One family owned from new, 89,693 miles. Mediocre old repaint that skipped being finished off on the door posts. Old undercoat in the wheel wells. Sound older interior and tight new top. The engine compartment is unrestored, orderly, but dirty. A sound and usable example with $16,000 in recent mechanical work after seven years in static storage. – The care this 230SL has received is apparent in its condition and giving some confidence to a new owner. The price it brought is parsimonious for its history and 4-speed gearbox. It could have brought 10-15% more without being unreasonable. 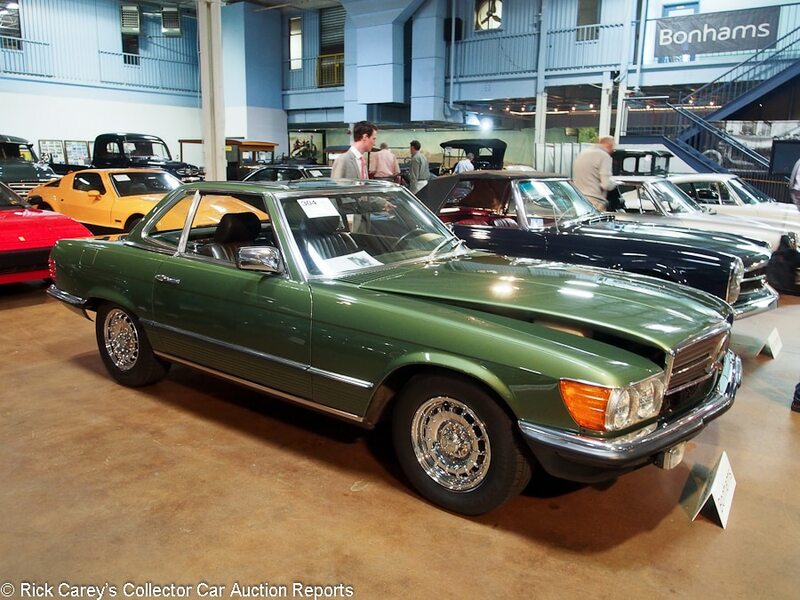 Lot # 304 1983 Mercedes-Benz 280SL Convertible; S/N WDB10704212015462; Engine # 11099012002722; Cypress Green Metallic, Cypress Green Metallic hardtop/Olive Green leather; Black cloth top; Estimate $22,000 – $28,000; Visually maintained, largely original, 3+ condition; No Reserve; Hammered Sold at $18,500 plus commission of 10.00%; Final Price $20,350 – Automatic, two tops, power windows, power seats, chrome later M-B wheels, Michelin blackwall tires, air conditioning, power steering, power brakes, limited slip, rear seat, Concord CD stereo, fog lights, owner’s manual, tools. – Very good clearcoat repaint in the original color. Four small stone chips on the left front. Very good original lightly creased upholstery and interior wood. Unusually good chrome. Orderly, clean unrestored engine compartment with some electrical fiddles. A good looking, cosmetically very nice driver quality car. – With both tops and a nearly exhaustive equipment list this is a quality 280SL that evidences good and consistent care throughout its life and is an exceptional value at this price. 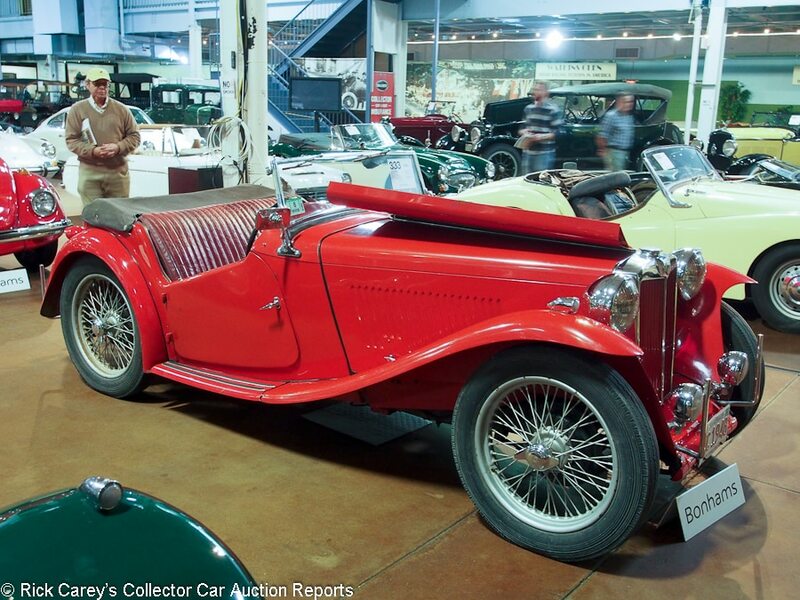 Lot # 333 1948 MG TC Roadster; S/N TC6156; Engine # XPAG6550; Red/Dark Red leather; Black cloth top; Estimate $30,000 – $50,000; Visually maintained, largely original, 4+ condition; No Reserve; Hammered Sold at $20,500 plus commission of 10.00%; Final Price $22,550 – RHD. Lucas fog lights, wind wing, nerf bars, Vertex magneto. – One owner until 2003. Microblistered old repaint, surface creased old upholstery, weak windshield frame chrome but good trim chrome. Oily engine and chassis. Peeling passenger running board paint. Needy but usable. – Despite the generous estimate range the result here accurately reflects this TC’s condition and history. 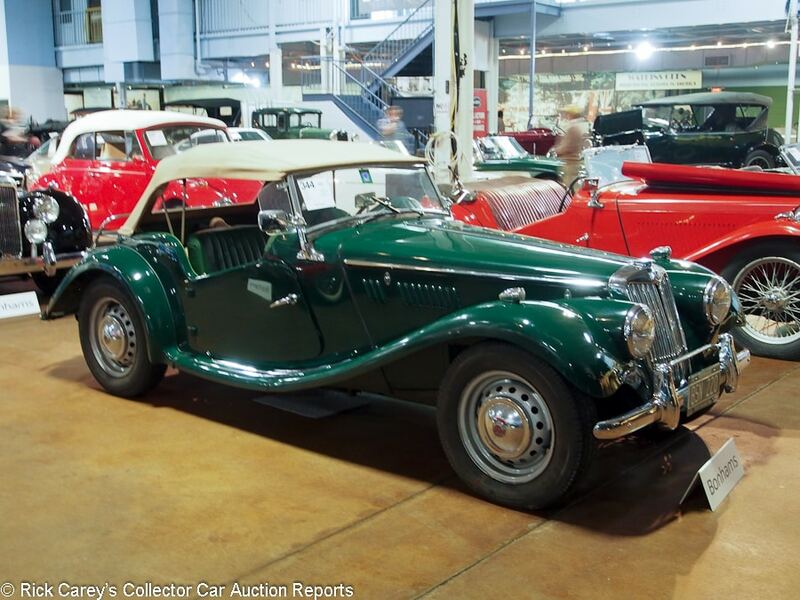 Lot # 344 1954 MG TF Roadster; S/N HDE431020; Engine # XPAGTF31073; BR Green/Green leather; Beige cloth top; Estimate $25,000 – $35,000; Older restoration, 3 condition; No Reserve; Hammered Sold at $19,000 plus commission of 10.00%; Final Price $20,900 – Silver painted steel wheels, hubcaps, radial blackwall tires Moto-Lita woodrim steering wheel, luggage rack, mismatched spare, wind wings, dual outside mirrors. – Good older paint, chrome, interior and top. Orderly but aged and slightly oily underhood. A fully acceptable driver. Roderick Rice collection. – Rather tired but well and consistently maintained and a sound value at this price. 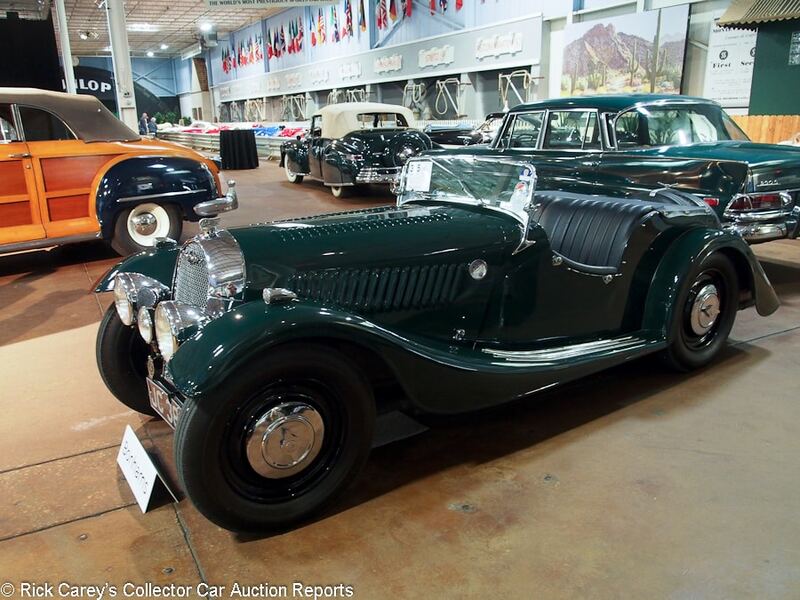 Lot # 315 1936 Morgan 4/4 Series 1 Roadster; S/N 96; Engine # M68; BR Green/Black vinyl; Estimate $40,000 – $60,000; Older restoration, 2- condition; With Reserve; Hammered Sold at $41,000 plus commission of 10.00%; Final Price $45,100 – RHD.1115/35hp Coventry Climax IOE engine, disc wheels, hubcaps, Avon blackwall tires, Lucas fog light and headlights, radiator stoneguard, folding windshield, dual rear mounted spares, banjo spoke steering wheel. – Restored like new with very good paint, chrome, upholstery and gauges. Chassis and engine were done like new and now show some age and use. – The first year of 4-wheel Morgans, an important turning point in the history of the marque and a design theme that persists to the present day, this is one of the foundation 4-wheel Morgans. It is impressively restored and maintained and is, by any rational standard, a terrific value at this price. 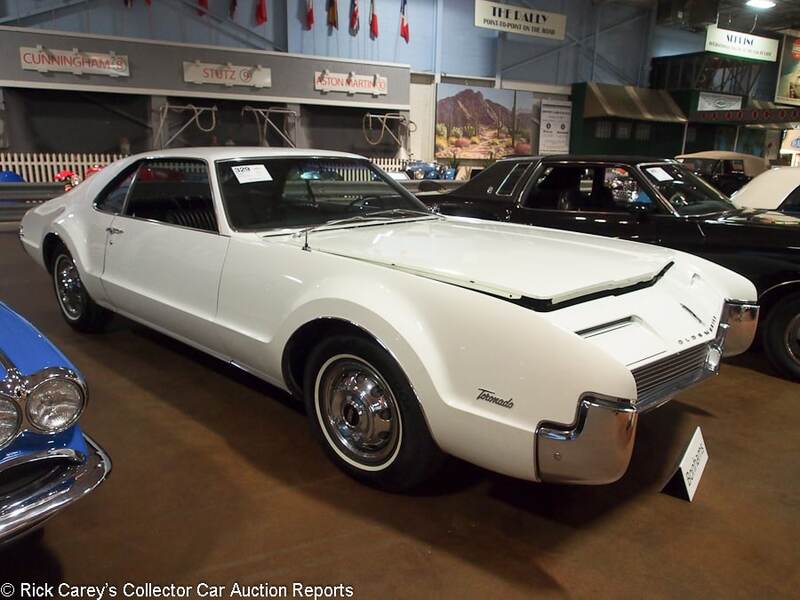 Lot # 329 1966 Oldsmobile Toronado Deluxe Coupe; S/N 396876M538074; White/Black vinyl; Estimate $30,000 – $35,000; Unrestored original, 3+ condition; With Reserve; Hammered Sold at $38,000 plus commission of 10.00%; Final Price $41,800 – Air conditioning, AM-FM, wheel covers, narrow whitewalls, tilt steering column, power steering, brakes and seats – Good original paint, chrome and interior. There is some rust bleeding out under the windowsill trim and a chip behind the right door. The underbody is dry and surface rusted where it hasn’t been dusted with chassis black. Clean original engine compartment. A sound and complete original Toronado showing 12,675 believable miles. – Sold by Mecum in Monterey in 2009 for $22,790 then hit a home run at RM’s Hershey auction a year later where it sold for $45,100. Its over-estimate price here is no more or less than it deserved for its preservation and condition. 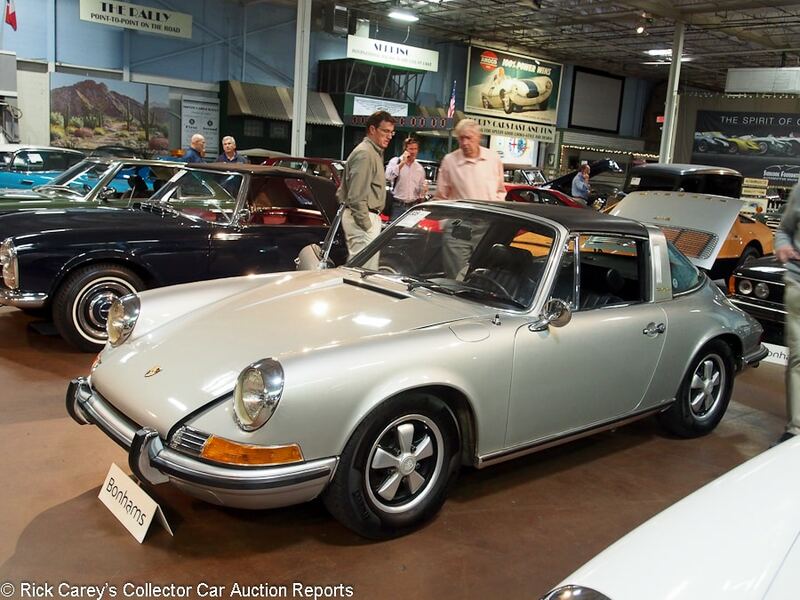 Lot # 305 1971 Porsche 911T Targa; S/N 9111110238; Engine # 6114329; Silver-Grey, Black leatherette roof panel/Black vinyl; Estimate $55,000 – $65,000; Visually maintained, largely original, 3- condition; No Reserve; Hammered Sold at $38,000 plus commission of 10.00%; Final Price $41,800 – 5-speed, Blaupunkt AM-FM, black rim Fuchs wheels, Pirelli blackwall tires, headrest seats, heated rear window. – Sound clearcoat repaint with some masking oversights and light orange peel that wasn’t adequately wet sanded. Worn roof panel seal, loose windowsill covering, sagging door pockets. Dry, dirty original underbody and engine compartment. Very magnetic body. Represented as the matching numbers drivetrain. – It is difficult not to like this fixed-window Targa, and even more difficult not to love it at this price, a sound value in a Porsche that has never been neglected or abused even with over 100K miles on the odometer. Service history would add to its appeal, but this result recognizes its absence with a substantial discount from the $50K it might have been expected to bring. 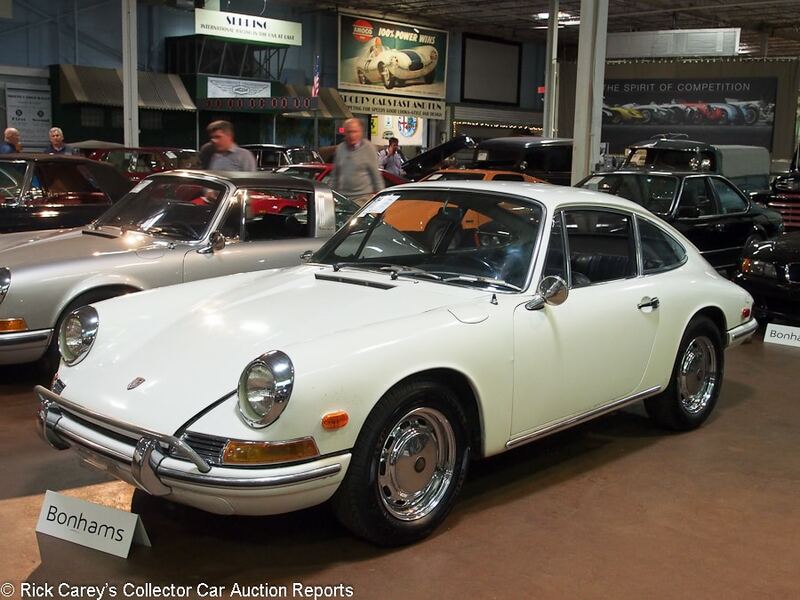 Lot # 349 1968 Porsche 912 Coupe; S/N 12801959; Engine # 1281776; White/Black vinyl; Estimate $35,000 – $40,000; Visually maintained, largely original, 3- condition; No Reserve; Hammered Sold at $25,000 plus commission of 10.00%; Final Price $27,500 – Chrome wheels, blackwall tires, Blaupunkt AM-FM. – Failing old repaint peeling and cracking on the rear fenders and engine cover. Sound old upholstery and interior trim. Rust blisters in the front fenders. Blistered horn grille chrome. Dry original underbody. Dusty, dirty engine compartment. – The rusty fenders are not unexpected and suggest there is other rot around and under this Porsche. The price it brought reflects its condition and the modest performance of its 1,582cc four. Lot # 311 1910 Regal Underslung Model N Roadster; S/N Engine No. 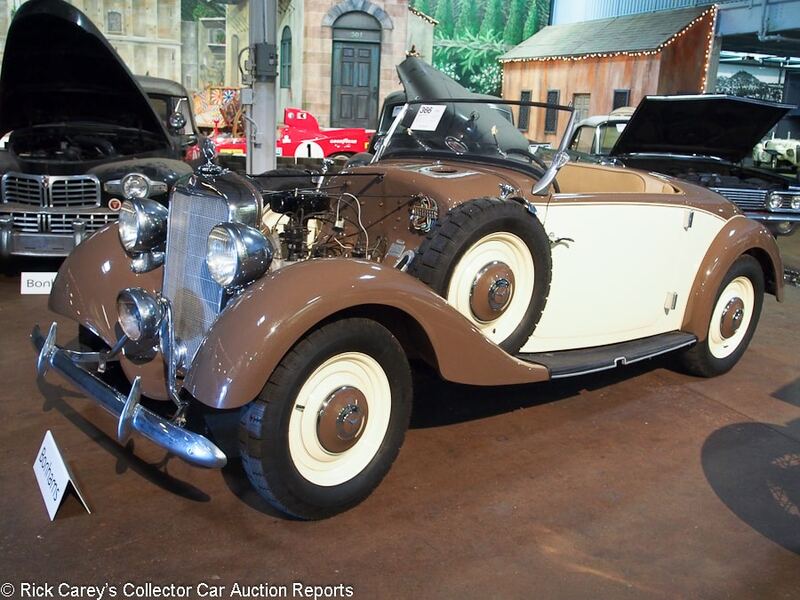 ; Engine # 3331; Brown, Black fenders/Black leather; Black cloth top; Estimate $100,000 – $150,000; Unrestored original, 4 condition; With Reserve; Hammered Sold at $150,000 plus commission of 10.00%; Final Price $165,000 – RHD. Stewart speedometer, Phinney Walker rim wind clock, E&J kerosene taillight and sidelights, Regal branded acetylene headlight, monocle windshield, folded bulb horn, acetylene generator, Juhasz barrel throttle carburetor. – Dull old paint and brass. Worn but sound old upholstery, worn old top. The engine and chassis are dirty and as found. A complete project in all important respects. It runs now and there is no reason it couldn’t be made to run and drive reliably without losing the patina. – The originality and equipment of this Regal is miraculously original, fantastically sporting and overall delightful. Its potential as a ‘preservation’ automobile is sweet and its low stance, sparse coachwork and funky erect old top are marks of a car that would be ruined by conventional restoration. It is the essence of the sensibility embodied by Dr. Fred Simeone’s and Miles Collier’s crusade for preservation. Expensive? Not a bit. It is history as it is hard to find today and its result shows that today’s bidders understood its significance. Lot # 323 1927 Rolls-Royce Phantom I 40/50hp Chassis; S/N S454FL; Engine # 20546; Blue/No; No top; Estimate $75,000 – $100,000; Incomplete restoration, 3 condition; No Reserve; Hammered Sold at $51,000 plus commission of 10.00%; Final Price $56,100 – 452/108hp, single updraft carb, 3-speed with later Hone overdrive, black wire wheels, Lester wide whitewall tires, Spirit of Ecstasy radiator mascot, dual sidemount brackets, lefthand drive Springfield chassis. – A restored running chassis original done by Frank Cooke with Piccadilly Roadster coachwork from chassis S178ML. In very good older restored condition throughout and seemingly ready for the body of the new owner’s choice. Sold with a large assortment of parts. – Sold at Bonhams sale of the Cooke collection in 2006 with the Piccadilly body for $172,000, then sold here three years ago in much the same older restored condition for $220,000. The body has since disappeared (perhaps back to its original chassis which was Cooke-restored with replica London to Edinburgh body?) leaving the new owner plenty of choices. 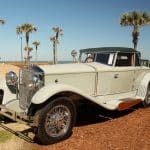 This is an historic Springfield Phantom I, well known among Rolls-Royce enthusiasts, and the new owner will be well-received when it is completed … or even driving it as is with a fruit crate for a seat. 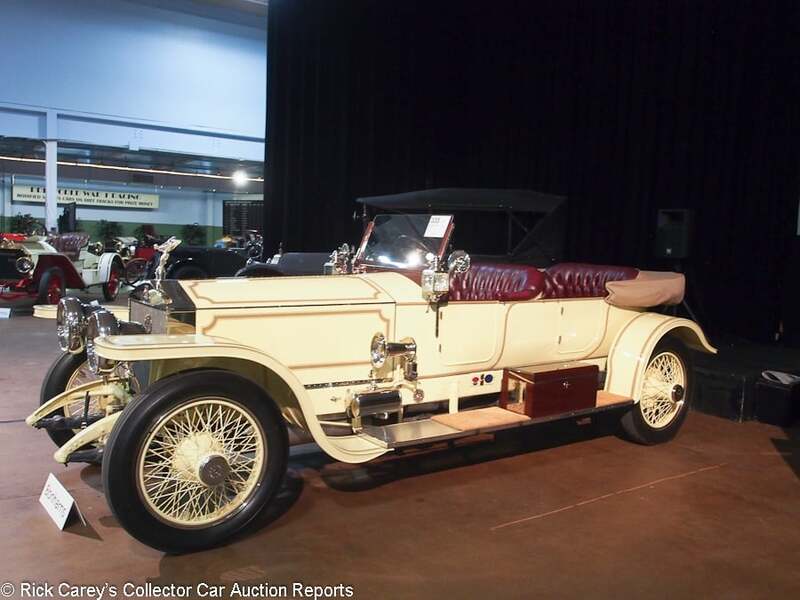 Lot # 335 1913 Rolls-Royce Silver Ghost 40/50hp London-To-Edinburgh Sports Tourer, Body by Gus Reuter; S/N 2380; Engine # 99B; Cream, Brown accent/Dark Red leather; Beige cloth top; Estimate $1,100,000 – $1,500,000; Rebodied or re-created, 1- condition; With Reserve; Hammered Sold at $910,000 plus commission of 10.00%; Final Price $1,001,000 – RHD. Overdrive, cream wire wheels, blackwall tires, Elliott speedometer, Boa Constrictor bulb horn, single right side spare, CAV electric headlights and sidelights, wood windshield frame. – Long owned by the Knowles family in Massachusetts, donated to the Henry Ford museum in 1941 with 2-seat coachwork. Bought from there as a rolling chassis by Dr. Sam Scher in 1968 (for $7,000) who fitted a new body (this one, probably) and returned it to the Henry Ford. Bought by Millard Newman. Later owners include Philip Peterson, Nic Moller and Dr. Veasey Cullen, Jr. since 2004. Concours quality older paint, interior, engine, underbody, chassis and bright nickel. Impossible to fault in any material way except that it’s not freshly done and that the body was built by Gus Reuter in the style of its original London to Edinburgh Tourer coachwork. – While some may scoff at the replica coachwork, it is the way it was originally built by Rolls-Royce and Barker and the intent of owners like Dr. Scher to keep it as intact as possible as well as several owners driving it extensively over the years confers no small measure of honor on it in its present guise. Starts and runs well and is a proud acquisition at this price. 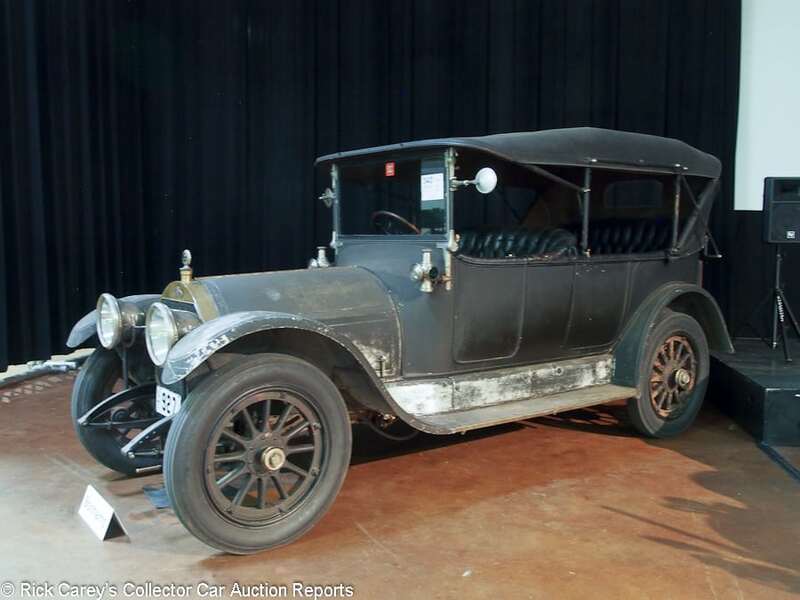 Lot # 343 1913 Stevens-Duryea Model C6 5-Passenger Touring; S/N 26392; Engine # 722C; Dull Grey/Black leather; Black cloth top; Estimate $150,000 – $225,000; Unrestored original, 4+ condition; No Reserve; Hammered Sold at $155,000 plus commission of 10.00%; Final Price $170,500 – RHD. Warner speedometer, right running board spare, varnished artillery wheels, electric bell headlights, electrified acetylene side lights, air starter. – All original, complete and magnificent. Two owners from new, with Roderick Rice since 1946. – This is a remarkable old car that has been maintained in miraculously preserved condition for years without ever having or needing a restoration. Yes, it’s somewhat dilapidated and the finish is severely aged, but its preservation in continually maintained, running and driving condition is wonderful to behold. Its only drawback is that it’s a Stevens-Duryea and not a much more recognized Pierce-Arrow, Peerless or Packard of comparable performance and quality. On the other hand, that makes it an inherently undervalued acquisition. 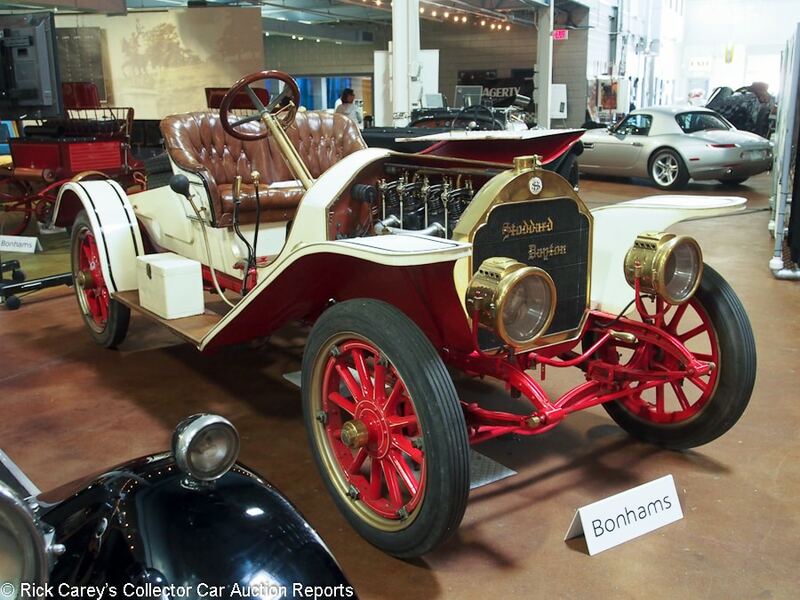 Lot # 354 1910 Stoddard Dayton 10C Raceabout/4-Seat Roadster; S/N 10C214; Engine # 10A302; Cream, Chocolate accent/Dark Red leather; No top; Estimate $125,000 – $150,000; Older restoration, 3- condition; With Reserve; Hammered Sold at $97,000 plus commission of 10.00%; Final Price $106,700 – RHD. CM Hall acetylene headlights, electrified Gray & Davis kerosene taillight, Rubes trumpet bulb horn. No top, windshield or other weather equipment nor indeed any provision for them. Hemi head ohv four with high-mounted camshafts on opposite sides of the engine and exposed valve gear including long rocker arms that reach all the way over the wide cylinder head. – Pretty tired. Dry, stiff leather, cracked, dull paint, oily, dirty chassis & engine. JB Weld repaired Stoddard Dayton carburetor. Semi-elliptical leaf springs, contracting band rear brakes. No windshield, top or top frame. 2-seat body with slanted rear deck, 2-seat rear tonneau included. 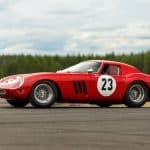 – Sold by Bonhams from the Richard Paine collection in 2008 for $144,500 and offered by Bonhams at Amelia Island in March when it was reported bid to $105,000. Its price here is remarkably low and it has immense potential. This engine’s creativity is wondrous to behold, an inclined overhead valve cross-flow cylinder head that is an instruction manual on how an Otto cycle engine works. The camshafts are flipped: intake cam on the exhaust side, exhaust cam on the intake side, with loooong rocker arms across the top of the head operating in wondrous syncopation. It took creative engineering to design and build it, akin to the similarly marvelous Prinz-Heinrich Benz from next month’s Bothwell Collection auction in LA. This is a hundred thousand dollar car; the Prinz-Heinrich is a million dollar car. That is value for money and a lot to like about this Stoddard Dayton. 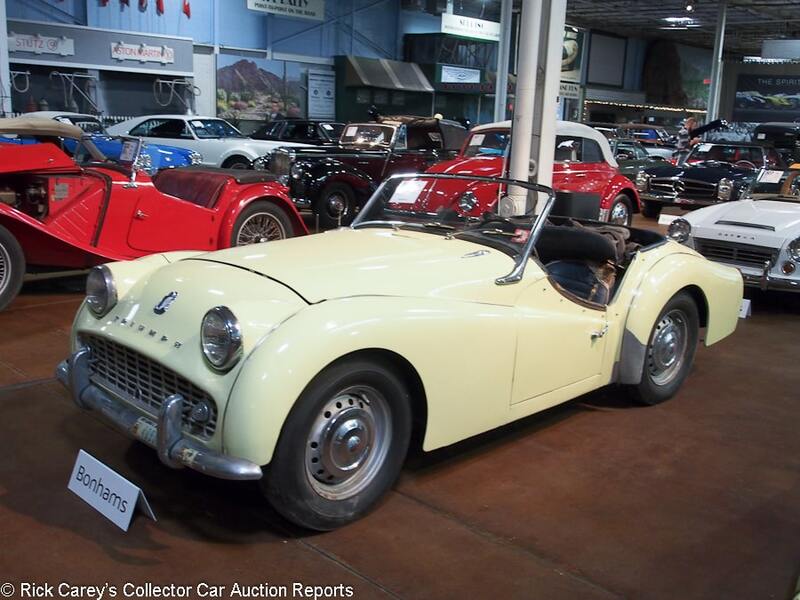 Lot # 308 1960 Triumph TR3 Convertible; S/N TS61943L; Engine # TS62186E; Primrose/Blue vinyl; Black leatherette top; Estimate $8,000 – $12,000; Unrestored original, 4 condition; No Reserve; Hammered Sold at $6,000 plus commission of 10.00%; Final Price $6,600 – Silver painted disc wheels, blackwall bias ply tires, side curtains. – Tired old repaint with a disturbingly filled body seam on the left rocker panel, tattered original upholstery and top. Solid body, A project that seems to have all its bits albeit all al of them need attention. A variety of bumper stickers points to a military owner in the Washington, DC area and hasn’t been used in years. – Long stored and neglected but apparently sound, this is a good value in a short door, wide mouth project TR3 that will engage its new owner for some time in taking care of its many needs. 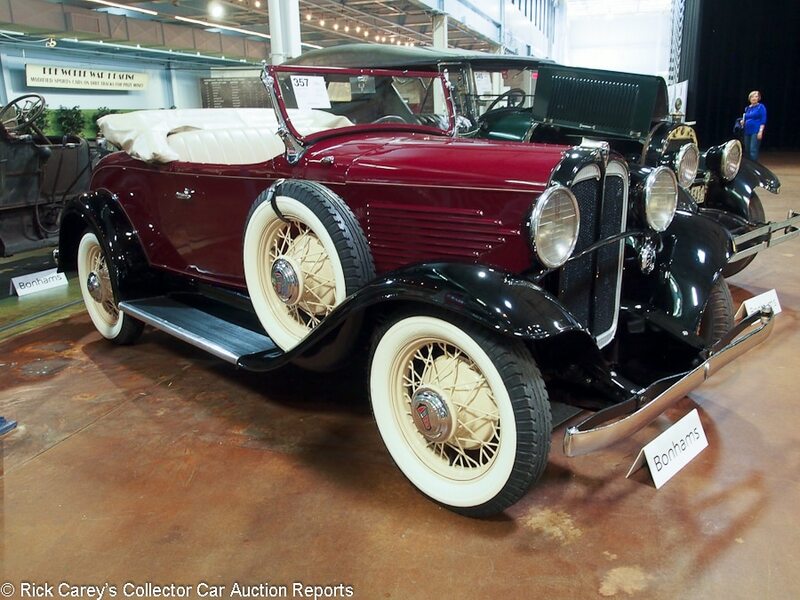 Lot # 357 1931 Willys Roadster; S/N 9724812; Engine # 9724931; Burgundy, Black fenders/Beige; Beige cloth top; Estimate $20,000 – $30,000; Older restoration, 3+ condition; No Reserve; Hammered Sold at $16,500 plus commission of 10.00%; Final Price $18,150 – Beige wire wheels, wide whitewalls, folding windshield, single sidemount. – Sound and attractive paint, interior and a small amount of chrome. Engine and chassis are done to good touring standards, as is the somewhat aged work on the chassis and underbody. A good touring example of an unusual marque and model with open bodywork. 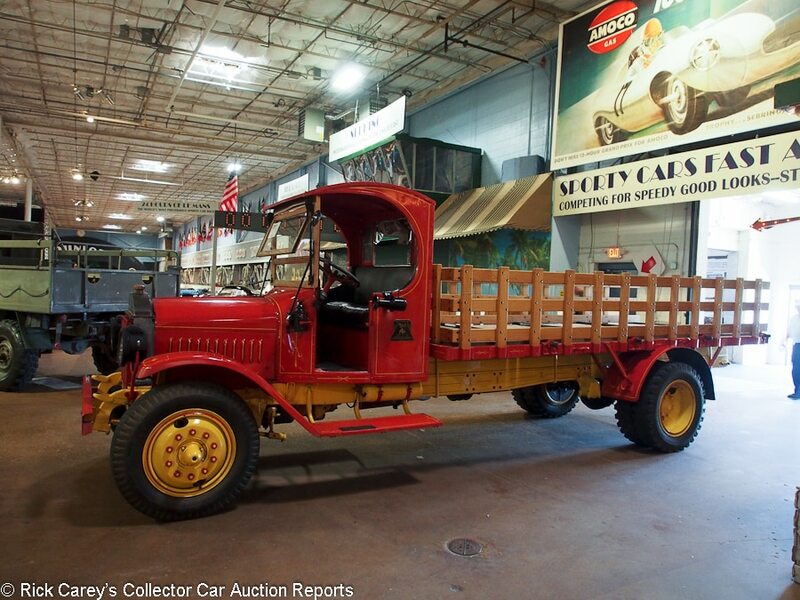 – For Model A money the new owner got a rare Willys with an ohv six and 65 horsepower; that seems like a good deal.